JAVEA SWIM SCHOOL offers swimming lessons and coaching for children and adults, for those who enjoy swimming for leisure as well as those who enjoy it for sport, such as triathletes. Their UK qualified swimming coaches have over 20 years of experience working in swimming schools and competitive swimming clubs coaching grass root beginners through to elite level athletes. Using indoor and outdoor pool facilities in the area, their passion for swimming will ensure that you reach your goals. Javea Swim School has exclusive use of the superb modern indoor pool facilities at the Laude Lady Elizabeth School in the Urbanisation Cumbre del Sol above Benitatxell as well as the outdoor pools at the Los Pinos Club de Tenis on Balcón al Mar and Camping El Naranjal in the Arenal area in Jávea during the warmer months. All of their classes work towards certification in a structured swimming programme designed to make learning fun and provide swimmers with the aquatic skills they need to progress. Group lessons during school term time contain a maximum of six pupils to one teacher for Beginners to Novice levels for children aged 4-12. Parent and toddler classes will contain a maximum of twelve pupils to one teacher. Swim club advanced level groups will contain a maximum of 15 swimmers to one coach and do lane swimming as a competitive swim squad. Javea Swim Club also offers children's birthday pool parties and can arrange for extra activities such as face-painting on request. Now introducing Aqua Aerobics classes every Saturday at 10:45am suitable for all ages and fitness levels. For dates and times of classes and events please see our What's On Guide here. 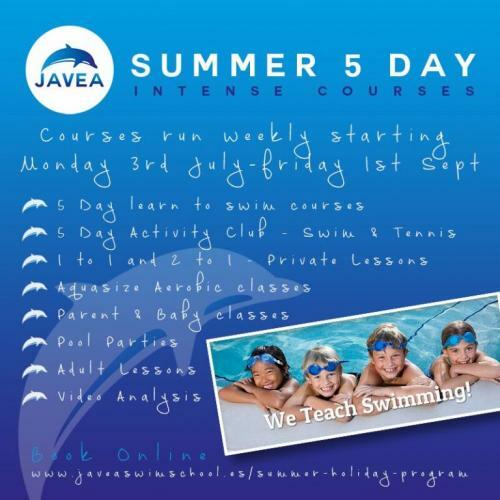 Please mention javeamigos.com when dealing with Javea Swim School. Rachel Louise Varrell - Fantastic! 4 year old daughter was so upset when she realized today was her last class! Will 100% be back for more classses - not that she will need many the speed she has learnt with you! Brilliant course! Keep up the good work! Hannah Vallance - My 3 year old is so excited about swimming every morning at the Easter intensive course. She has a huge grin on her face for the whole session which is fun from the minute she arrives. The class is really building her water safety skills and confidence. The team have a lovely way of being attentive, playful and engaging with the kids who are obviously loving every minute. Thank you! Gail Taylor - My girls (aged 5 & 3) are loving the Easter intensive course and are progressing really well. It looks like they're having lots of fun in the water too and yesterday my daughter jumped in without holding hands, which we tried all last year to get her to do with no success!! Would definitely recommend.